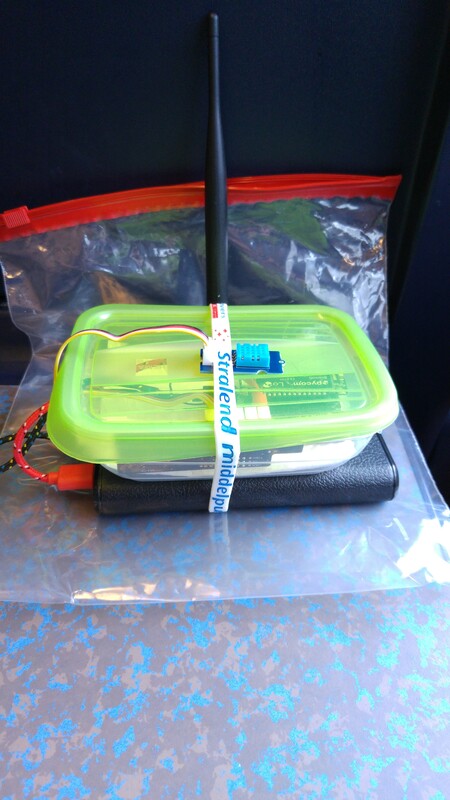 What happens if you take a LoRaWAN node with you in a train while you travel across the Netherlands for about 2,5 hours? I did not know and wanted to find out today because I had to be in Zwolle for a meeting. So I charged a big external battery (with 2 USB ports), drilled a couple of holes in a plastic container to guide through the micro-USB connectors, and put in some bubble foil inside for safe transport. I drilled another hole to connect the external antenna for the LoPy node. 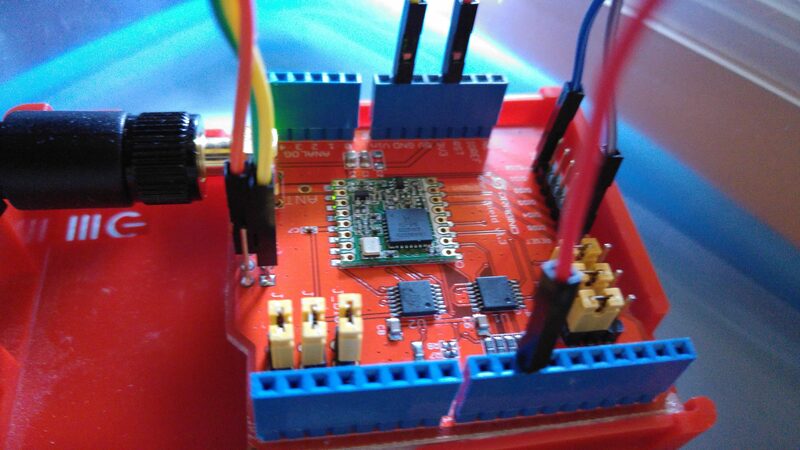 Besides the LoPy, I put the Marvin in the box, with the temperature/humidity sensor on the outside of it. Not that it really mattered, today was going to be about finding gateways while I was on the road. Things did not look good for the experiment though in the morning. 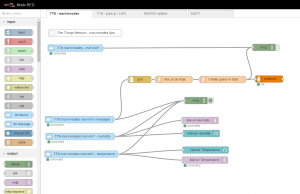 The Things Network (TTN) backbone was acting up again. That was a bummer, because I still had to change the code on the LoPy. 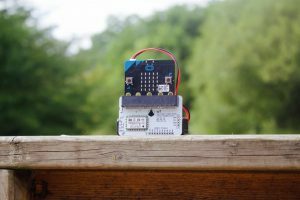 It had the code installed for the Circuit Playground and I wasn’t planning on bringing that also. So I changed the code to a simple “send a number every 30 seconds” but was not able to test it before leaving for the train. To make matters more balanced: I decided to have the Marvin connect to the KPN network (still got 60 days left on my free trial), but the Hookbin.com server decided that today was a good day to refuse to work. And I needed a place to store the data sent by the Marvin. Luckily I found loggly.com another site that you can use as a destination for KPN nodes. I think it is better than Hookbin btw because it keeps more records and even the free plan should be enough for most people. 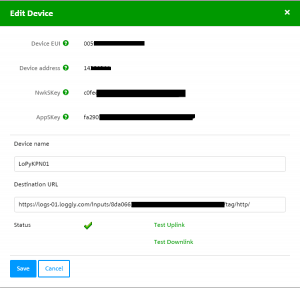 Another nice thing was that Loggly also can act as an HTTP-integration for TTN, so I could collect both the data sent via KPN and the data sent via TTN in one single place. 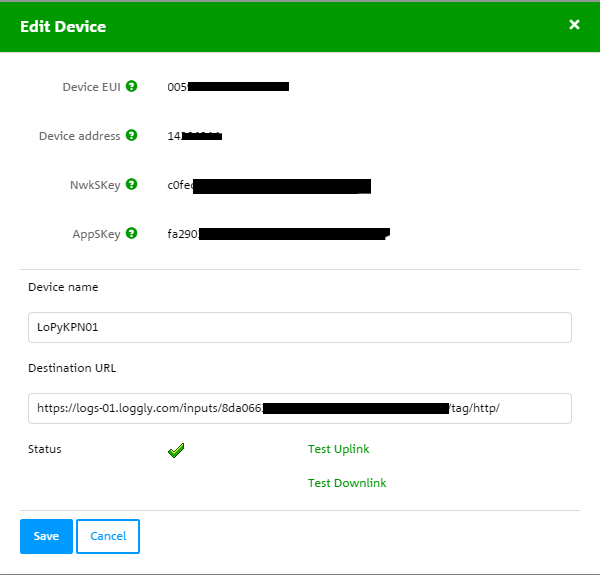 Quick tip: Loggly provides you with an http:// url for the endpoint, KPN doesn’t accept http:// but you can simply change the provided url to https:// and then it works. OK, into the train. I wasn’t really sure what to expect. A train means lots of metal and a fast moving object (and nodes). If there is a thing that is dislike most, than it is giving up on a technical problem before it is solved. 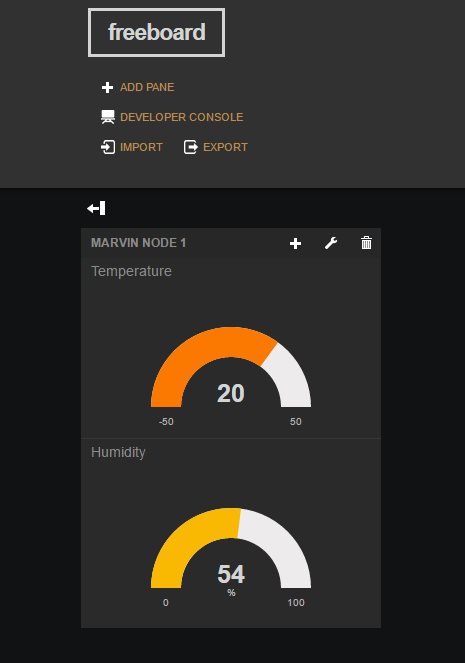 So, although this weekend a late cold finally managed to make me sleep more than usual, I did manage to spend some time with The Things Network, the LoPy Nano Gateway and the Marvin Node. So, one thing that really can kill your debugging efforts is the fact that the backbone for The Things Network is rock solid stable. I don’t know whether that just is the case during the weekend, but like last week, this weekend there were some outages. There is no single status page that you can check, so that makes it a bit hard. But I’m starting to learn that if the console page act oddly, like failure to show the gateways that I defined, or if suddenly everything is displayed is disconnected, it might just be that they are having problems on their end. Who am I to complain about a free service? I know, still, an automated page that tells me if I need to just wait and do other stuff, would be nice. But during the uptime, I was able to get some more stuff working. First of all: the code that Alex used in the video does work, just make sure you select “Packet forwarder”. Basically it just sends 200 packages within a short time and then stops. So if you don’t know that, you’ll think the node stopped working. It does, but on purpose. Now if you reset the LoPy, it will start again, but the TTN backbone will ignore that data because the LoPy will start again with package #0, and the backbone will already have a package #0. 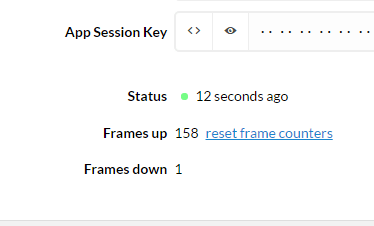 The quick solution during testing is to reset the frames counter for the device. 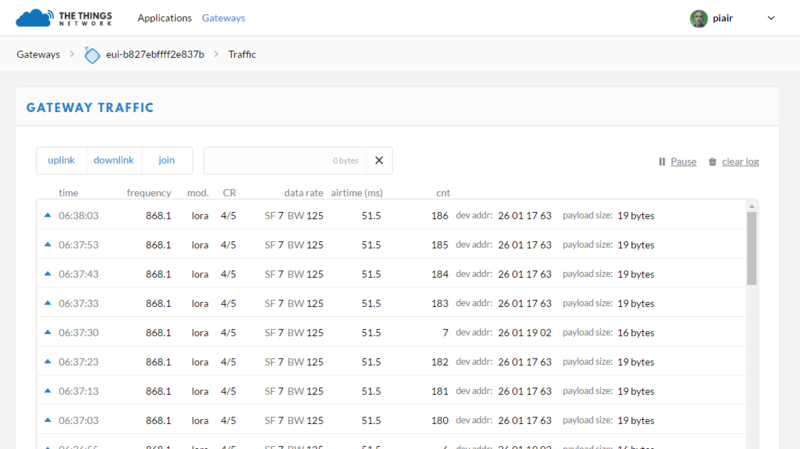 Also, the test script is nice for testing, but LoRaWAN was not build for a rapid stream of data, so make sure you read the post about the TTN Fair Access Policy, even with small messages at close range, the 500 messages (of 10 bytes each) per day at SF7 means max. 1 message per (about) 3 minutes, the script sends one every 10 seconds. Granted, it stops after 200 messages, but if you repeat that 2-3 times during testing, you go above that. For me, testing it on my own Nano Gateway, the chances that I “steal” airtime from other nodes is small, but if you’re using someone else’s gateway, you could be causing problems for other nodes being unable to get their messages through. But like I said in the title, the weekend showed there is still some love left. I managed to get a few more things working with my two nodes. LoRaWAN + The Things Network = Tough Love or No Love ? If your are used to learning stuff without there being a clear manual available, without a teacher that gives you a step by step breakdown of what to do, like when you like to experiment and play with electronics or ict, then you know how frustrating the process of trial and error can be to get something to work. And how rewording it is when it does work in the end. There are limits however. And LoRaWan in combination with The Things Network (TTN) is really testing my limits with this regard. 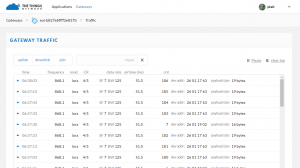 Because it turns out it is really tough to get it to sort of work, even though it looked easy at first, and I am not sure anymore whether this is good and a way to learn all the ins and outs of LoRaWAN and TTN or whether it just is not worth it (yet). So, what is the current situation? On Monday I wrote about connecting the Marvin node to KPN, that worked surprisingly good and was easy to do. 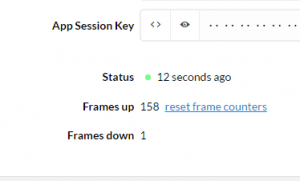 Connecting the LoPy as a node to KPN was just as easy. But since KPN is a paid solution and I don’t have a use-case that warrants that amount of money, I kept on looking. 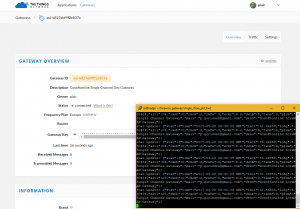 On Tuesday I wrote about setting up a single channel gateway for TTN. That worked also, but only for half a day. At the moment, I understand it sort of was surprising that it worked at all, though online information isn’t always very clear whether failure is by design or by accident, in particular because that info was from before I got the gateway online. Currently, that gateway shows as connected in the TTN console, but no data has been transferred by it since it disconnected Tuesday evening. The LoPy Nano Gateway still is online, data from both of the nodes is being displayed in the console page for the gateway (see image), but not always and none of that data (except for the first few hours) is displayed at the data page for the nodes. So basically I now have a functioning gateway and still no data from the nodes. Give up or go on? Personally I don’t have any use-case for nodes that need to be in a location where there is no WiFi. Yes, WiFi uses a lot of battery power, but for the more battery sensitive stuff, 433Mhz transmission also works, and I have got plenty of those lying around. Yes, I know that Single Channel Gateways or Nano Gateways are not LoRaWAN compliant. So, I cannot blame TTN if they don’t (fully) support them. And nobody is forcing me to use their free infrastructure. But I am someone that would be willing to spend the couple of hundred euros needed to put a gateway on my house, either by building one for 200 euros or buying one for 400 euros, but with this little succes (and love) in a test setup, that is not going to happen. Because I really don’t know if spending that money would fix all the current problems. So for now, my home village will have to do without TTN capabilities. I did post a question on the Pycom forum, maybe Alex can shed some light on the problems, maybe he has suggestions, other than that, I don’t know what to test for now. If someone has a spare gateway lying around that he wants to borrow or donate to get Deurne (NL) on the TTN map, let me know! Zo is het een tijdlang zo goed als stil rond LoRaWAN en dan komen er opeens meerdere berichten voorbij erover. Tijd dus voor een korte update. De LoPy Kickstarter staat op het punt om uitgeleverd te worden. Geplande datum is op het moment 26 september, slechts 1 maand later dan gepland. Ik zal er zo iets meer over vertellen, maar het kan natuurlijk zijn dat je nu denkt: wat is LoRa / LoRaWAN? 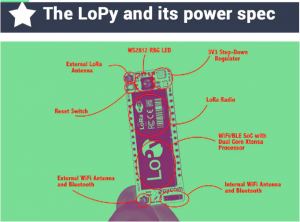 LoRa en LoRaWAN zijn merknamen van de LoRa alliance, LoRa is een van de manieren waarmee je een Low Power Wide Area Network (LPWAN) kunt opzetten (en dat heet in het geval van LoRa dan een LoRaWAN). Een concurrent van LoRA is NB-IoT (zie daarvoor ook dit bericht). Om het concept te begrijpen is het eigenlijk voldoende om naar de naam “Low Power Wide Area Network” te kijken: het is een netwerk dat over grote afstanden kan communiceren (Wide Area Network), dan heb je het in ideale situaties over kilometers. En het is “Low Power” waarbij het gaat om sensoren die weinig bandbreedte verbruiken. Dus geen webcam die in 4K data verstuurd over grote afstanden, maar bv een sensor die de temperatuur, luchtkwaliteit, aantal voertuigen dat voorbij komt etc. en die info doorstuurt naar een gateway die op zijn beurt wél aan het internet aangesloten is. De kosten van die dataverbinding kunnen dan laag zijn (bv bij KPN) of helemaal gratis (het idee achter het The Things Network). Dat laatste (gratis) zou mogelijk zijn als genoeg bedrijven / individuele gebruikers een gateway installeren waarmee ze een beetje van hun meestal tamelijk ruime bandbreedte beschikbaar stellen voor het LoRa-verkeer. Vorig jaar waren er niet lang na elkaar 2 Kickstarter campagnes waarbij LoRa centraal stond. De eerste was van The Things Network, waarvan de oprichter op 4 oktober ook bij SURFnet zal zijn. 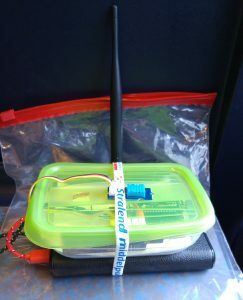 Het idee achter The Things Network is dat het mogelijk zou moeten zijn om een landelijk dekkend LoRaWAN op te zetten waar iedereen gratis gebruik van kan maken. Daartoe zijn ze bezig met de ontwikkeling van een (relatief) goedkope LoRa Gateway. Het idee zou haalbaar moeten zijn omdat elke Gateway een heel groot gebied kan afdekken, in mijn geval zou ik mijn hele dorpje kunnen afdekken. Ik heb toen niet met die Kickstarter meegedaan omdat het sowieso voor het eerst was dat ik van LoRaWAN hoorde en ik toen (en nu nog steeds) voor privégebruik wat meer moeite heb met het vinden van use-cases. De strijd met KPN om als eerste een landelijk dekkend LoRa-netwerk te realiseren hebben ze overigens verloren, de Kickstarter heeft vertraging opgelopen. Dat laatste is overigens niet vreemd bij Kickstarter-projecten en dat weet je als het goed is als je er aan meedoet. Specificaties worden soms tijdens de campagne nog definitief gemaakt, aantallen te produceren exemplaren zijn afhankelijk van het succes van de campagne (een succesvolle campagne haalt veel geld binnen maar heeft vaak ook daarna praktische uitdagingen tijdens de productie) etc. Toen daarna echter de LoPy Kickstarter voorbij kwam, wist ik inmiddels iets meer over LoRa en heb ik besloten om wél mee te doen. De LoPy is qua fysieke omvang en qua doel beperkter dan The Things Network, maar desondanks toch een heel veelzijdig device. 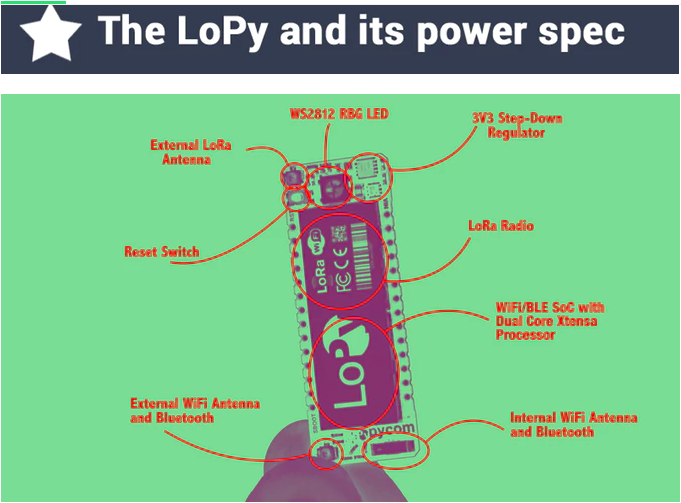 Naast ondersteuning voor LoRa is er Bluetooth Low Energy aanwezig én WiFi. Ondersteuning voor The Things Network is er ook en hij is in te zetten als nano Gateway met ondersteuning voor 100 gelijktijdige clients. Ik heb er 2 in bestelling, inclusief externe antenne, genoeg dus om in ieder geval eens te experimenteren met het bereik ervan in bebouwde omgeving. Belangrijkste nadeel / risico wat mij betreft is dat die plekken waar ik niet met WiFi of Bluetooth uit de voeten kan in combinatie met een sensor, ook meteen plekken zijn waar ik niet zomaar zo’n sensor kan/mag/wil installeren. Immers, als iemand hem tegen komt, denkt “hé, leuk, die neem ik mee” (ik kan me verhalen herinneren van zenders bij bushaltes waar zoiets mee gebeurde), dan is het snel einde oefening. En daar zijn ze net wat duur voor. Als ik naar het programma van de SURFacademy bijeenkomst kijk, dan gaat het zeker niet alleen over LoRaWAN, ook al staat Wienke Giezeman, initiator van The Things Network prominent in de aankondiging. De samenwerken met studenten voor zorginnovatie in het Huis van Morgen zal ongetwijfeld ook andere IoT voorbeelden bespreken (ik ben niet bij het programma betrokken). Ik zie geen hands-on onderdelen in het programma, het lijkt me meer een mogelijkheid om voorbeelden op te halen van wat anderen al met IoT / LoRaWAN doen (en wellicht je eigen voorbeelden te delen). Aanmelden via de website is zoals gebruikelijk gratis. Wellicht kun je het dan combineren met een bezoek aan de voorlichtingsbijeenkomst over de stimuleringsregeling open en online onderwijs die ’s ochtends plaats zal vinden. Wellicht een idee om open en online onderwijs te ontwikkelen dat door onderwijsinstellingen te gebruiken is als introductie op het gebied van Internet of Things, de maatschappelijke betekenis ervan, praktische implementatie etc. ?